The London based design company Airside created these rather gory and terrific looking t-shirt designs inspired by Kinji Fukasaku's great Japanese film Battle Royale (Batoru Rowaiaru, 2000). Each shirt cost around £24.99 and they come in many different sizes for males and females. Airside also offers shipping to to anywhere in the world. 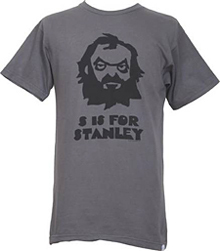 This interesting S IS FOR STANLEY t-shirt features a portrait of director Stanley Kubrick (A Clockwork Orange, 2001: A Space Odssey, Dr. Strangelove, etc.) and was designed by the acclaimed London based graphic artist JAKe who's probably most well known for his portraits of artists like Massive Attack, Beastie Boys and Oasis in NME. His other design projects include work for Ugly Duckling, Steinski / Sugarhill Records, and Lucasfilm ( Star Wars). This designer tee is available from Giant Peach and sells for $32. Giant Peach is based in California, but they offer international shipping to anywhere in the world. For more information please see the Giant Peach website. Tonic Clothing is an ethical clothing label, offering a range of t-shirts, polo shirts, hoodies and bags. I'm not wild about a lot of the designs on the site, but I do like this Shootist t-shirt. 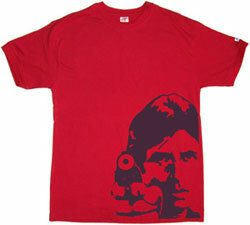 At first glance, you might think this is a Scarface t-shirt, but it's actually Amitabh Bachchan, star of 1979 Bollywood blockbuster The Great Gambler. The shirt is made from ethically-sourced cotton, with the design sat rather smartly at the bottom left-and corner. Sized from small to large, you can pick one up for £2. Fiftyseven-thirtythree is a new silkscreen tee company working out of Oakland California. According to their shop info, they "use images of people who were originals or broke through some pre-existing barrier or stereotype" for their designs. 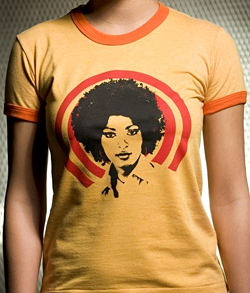 The beautiful black American actress Pam Grier is definitely a great example of a woman who broke down some pre-existing barriers in Hollywood and you can celebrate her accomplishments with this terrific Pam Grier Ringer Tee designed by Fiftyseven-thirtythree. The design sells for $25.00 and is available for women and men in various sizes. They ship to anywhere in the world, but you must contact them for a shipping quote if you live outside the U.S.
To see more of Fiftyseven-thirtythree's great designs please visit their official shop at Etsy. T-shirt designs can get a little boring so it's always exciting when I come across bold new designs that really catch my eye. Kindred has a lot of interesting and original movie tees in their online shop that are well worth a look. Some of my favorite designs are pictured above and they're inspired by two of Alfred Hitchcock's most popular films, The Birds and Psycho. Kindred offers international shipping and most of their shirts retail for $24.95.